Our TubieGuard accessory is a simple solution to the problems experienced by many patients who rely on tube feeding. We invented an enteral feeding tube lock that patients in your facility or institution will benefit from immediately. The TubieGuard is a revolutionary device which secures enteral feeding tubes where they connect. The TubieGuard was designed and developed by Jill and Ryan Duval in answer to their frustration of separating feeding tube connectors, leaking feeding tube connectors, eliminating accidental disconnection or tampering with the delivery of the feeding solution. The TubieGuard is a protective case for Enteral Feeding Tube connectors which prevents formula leakage, accidental disconnection, and waste. Tube feeding is done in the home, in hospitals, in nursing facilities and other institutions, on infants, children, and adults of all ages. The TubieGuard has proven to be an effective tool for all types of enteral feeding, patient care and maintenance. The TubieGuard will accommodate all brands and styles of enteral tube feeding connectors and is available in three colors. Enteral tube feeding delivers a patient’s daily nutrition when he is unable to eat or drink safely, and unable to attain adequate oral nutrition. 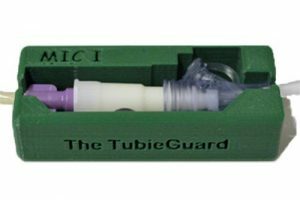 The TubieGuard has proven to be an effective tool for all types of enteral feeding, patient care and maintenance. The TubieGuard device that improved enteral tube feeding for every single user! Using The TubieGuard will help reduce the waste of expensive formula and other supplemental nutrition as well as save skilled labor time, money and frustration. A patient’s treatment experience will be enhanced significantly using The TubieGuard in General Hospitals, Skilled Nursing Care Facilities, and Rehabilitation Centers. Care providers and administrators may email or call (781) 264-0229 for institutional pricing and ordering. A TubieGuard product specialist will contact you immediately.